Back in November Zac Crain wrote a very indepth article about MotorSport Ranch titled: Fast Times at MotorSport Ranch. Zac really hit the nail on the head with his thesis that MotorSport Ranch "redefines the country club". I emailed Zac today and suggested that he follow-up on the piece detailing the MotorSport Ranch pilot and this blog. MotorSport Ranch is a reality television program about a country club for race car enthusiasts. Filmed 100% in 1080i HDTV, the show will air on INHD in late Summer 2005. For more information contact Alexander Muse at 214.550.2003. This morning after bootcamp I decided to get busy and send Bob my edits for the MotorSport Ranch DVD cover-art and disc-art. The graphic designer made the disc-art too slow with no redline (my father thought we should move it to 7500rpm - view his comment). I added a redline and moved the rpms up and added a link to the website. At MotorSport Ranch, the members play neither golf nor tennis. There is no pool. They don’t host Easter egg hunts. This Texas country club boasts a state-of-the-art racetrack, clubhouse, and private garages for members. The members are from every walk of life including teenagers, businessmen, mothers and millionaires and race everything from their daily drivers to supped-up exotic sports cars. This is not a Hollywood set! MotorSport Ranch has been a fully operational country club for the past several years, run by ranch-owner, Jack Farr, and his trusted ranch-hands. This one hour format unscripted reality program details the overall concept of a race car country club, the on and off track lives of three members and features a very unique race between three very different cars. MotorSport Ranch offers you, the viewer, access to THE country club of racing where the members have a passion for speed. So if you want to see how these rustlers tame their urge for fast action, tune into MotorSport Ranch. The race is on! Yesterday in my daily post on the progress of the MotorSport Ranch television project I indicated that the ISBN arrived. Today I recieved the an email from Marina Dallendofer from Bowker with the EAN13 bar code we ordered for the MotorSport Ranch pilot DVD. Bowker sends the bar code as a ZIP file and inside the ZIP file the actual bar code is in an EPS file. They recommend forwarding it directly to your printer - that is the actual bar code on the left! You may recall from a previous post: How to Publish and Sell your own DVD - in two hours... where I started the process of "publishing" our the DVD for the pilot MotorSport Ranch episode. Today I received our ISBN log book from Bowker. Basically they proclaimed our production company, hive.media, to be a "publisher" and gave us ten ISBN numbers we could use to publish various titles - including MotorSport Ranch. They provided a link to the Bowkerlink so that we could provide information related to our titles - about a ten step process - took me about 15 minutes to complete. The Bowkerlink site indicated that the title was pending - I assume a human must review the information before it is entered into the Books In Print system. Next I visited the Amazon.com Advantage site to enter the ISBN number to get the DVD listed on Amazon. It was a bit confusing - but I entered the data - I am not sure what the next step there is. I will keep you posted on my progress with Amazon. TIVO (PVR technology) will make boutique shows (like MSR) and niche networks (like INHD) more relevant. Gen May from the PVRBlog posted an entry today that got me thinking about MotorSport Ranch. Here is the gist: viewers without TIVO (or other PVR technology) watch programming from only 15 channels (out of 60 available). The original article from MSNBC cut against my theory, but I am convinced that TIVO allows me to select content instead of channels or networks. I look for programming, I could care less where it airs - TIVO gives me the power to grab the content and play it whenever I want. I assume this will be a good thing for the MotorSport Ranch pilot and potential series. For example, I NEVER watched the Travel Channel before I had TIVO - now I watch one or two series (World Poker Tour to name one) only found on that network. Oh and what about OLN (Outdoor Life Network channel 800 or something) - they run the Tour de France each year - we keep that running in Architel's Network Operations Center during the summer. Anyway, what do you think? Will you watch MotorSport Ranch on INHD? Or just watch MotorSport Ranch on TIVO? 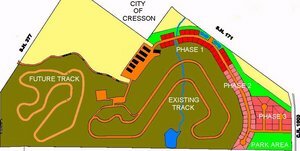 If MotorSport Ranch was not crazy enough - trackside housing? If you have been following this BLOG you know that we filmed a reality television pilot (to air on INHD in late summer 2005) at a place called MotorSport Ranch. The venue is unbelievable - imagine a luxuriously rustic country club in Texas where instead of having a golf course or tennis courts the club boasts a 1.7 road track and everything else you could imagine for the racing enthusiast (club house, private garages, mechanics, racing schools, and so on). This is real place - not a Hollywood set! I was out at the track a few weeks ago for my business partner's brothers bachelor party. We rented the track and several race cars for an afternoon of training and racing. I noticed a few houses being built around the track and found out that Jack is offering trackside homes to racing nuts. The project, called Villas at MotorSport Ranch offers lots from $60K and homes starting at the mid $200's. Many of our more dedicated visitors have actually visited the MotorSport Ranch TV show website. It was done completely in FLASH and more often than not people have a hard time getting the page to work properly. Additionally, FLASH indexes rather poorly with the search engines - specifically GOOGLE. I have previously mentioned that my partner and I run an IT outsourcing business called Architel when we are not producing reality TV shows like MotorSport Ranch. Given the success of this BLOG we decided to start publishing a blog related to that business as well. Take a look: http://blog.architel.com. The MotorSport Ranch television show was mentioned in D Magazine's blog, the FrontBurner, this afternoon. They titled the entry "NEW LOCAL TV SHOW THAT ISN'T YET A TV SHOW" and explained that we were still looking for "distribution". I am happy to update everyone that we did sell the show to a high definition network called INHD (primary competitor to Mark Cuban's HDNet). For more information about the deal visit a previous titled: We sold the domestic HD rights to INHD! We are still waiting for an air date: Still no INHD air date for MotorSport Ranch pilot, but we have been promised a late summer slot. We will keep you posted. That connected FrontBurnervian tells me things are looking up for MSR: They have sold the HD rights to INHD, and it will start airing this summer. INHD also provided a local exception for KERA to run it in HD. So keep an eye out for it.